Mario & Luigi: Superstar Saga image. Mario & Luigi: Superstar Saga + Bowser's Minions image. Superstar Saga + Bowser's Minions Description Press the Button before Mario Jumps on Luigi! Press the Button when Mario is directly over Luigi. Press when they smash into the enemy. Time button inputs well for an Excellent rating! Splash Bros. is one of Mario's Bros. 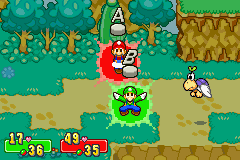 Attacks in the game Mario & Luigi: Superstar Saga. It is based off of the Spin Jump. The move costs four BP on Modes 1 and 2, and three BP on Mode 3. The move involves Mario jumping on Luigi throwing him in the air, then Luigi jumps under Mario, grabs him, and they both do a Spin Jump, with a huge flip at the end, to slam into the attacked enemy. The buttons that must be pressed are to have Mario jump, to have Luigi leap under him, and again to slam the enemy. This moves act as a jump attack, so if used on spiked enemies (like Sharpeas and Spinies), Mario will be harmed. After successfully executing the attack twenty times, the Advanced version is learned. In the Advanced version, instead of jumping up to Mario, Luigi throws him in the air again. Mario then spins very fast, drilling into the enemy. The commands are to make Mario jump, again to align Mario above Luigi, to throw Mario in the air, and again to drill into the enemy. The move does less damage than the regular version against most enemies, but does double damage against spiked enemies like Sharpeas and Pestnuts. In Mario & Luigi: Superstar Saga + Bowser's Minions, instead of Modes, there is only the "Easy" and "Normal" difficulties to choose from, with the latter costing 4 BP and the former costing 6 BP to use. The controls are exactly like that of the original game, however that is not true for the "Super" version of the Splash Bros. attack; instead, Mario will hop off of Luigi's shoulders 3 times, i.e. pressing twice, pressing on the third hop, and finishing it by pressing as soon as Mario comes crashing down on an enemy. The "Super" variation also seems to have its mechanics reversed from the original version; it is stronger when used against non-spiked enemies as opposed to spiked ones but still retains immunity to damage from spikes. This page was last edited on March 25, 2019, at 07:10.